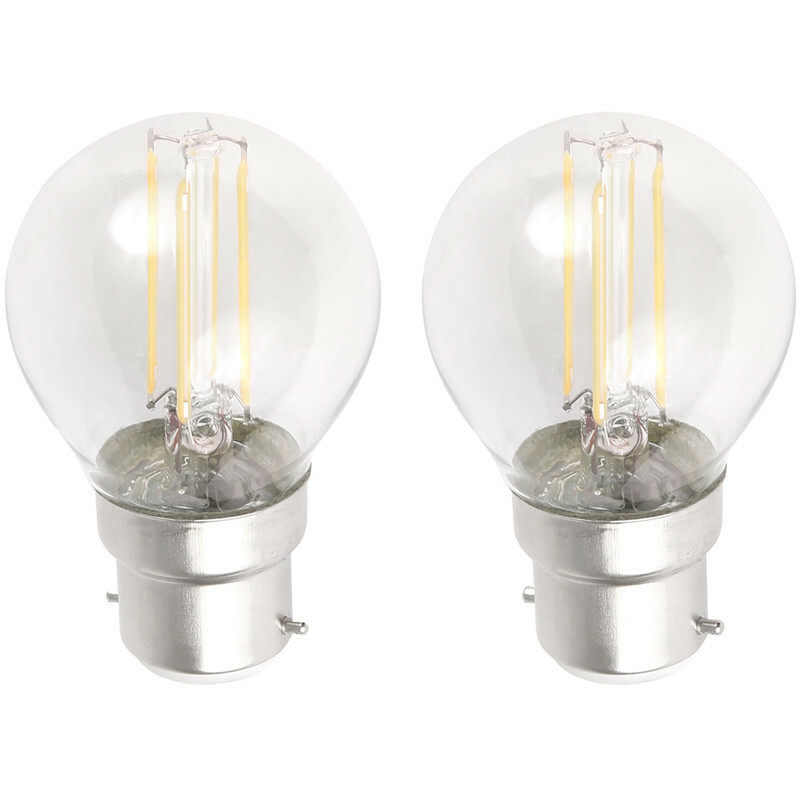 LED Filament Globe Lamp 4W SBC (B15d) 460lm (2 Pack) is rated 4.9 out of 5 by 39. Rated 5 out of 5 by JC12 from Very good light Great value, bright light one tenth of the consumption of 40w bulb. Rated 5 out of 5 by A knuckle dragger from These are smaller than the normal size bulbs I expected these to be the same size as the normal size bulbs used just about everywhere, these are SMALLER !!! I (but more importantly my wife) am however happy with this smaller size as it turned out to look great in the light shade we are using 3 of them. The light from these yellow stalk LEDs are far better than any supposedly "warm" light (still cold white if you ask me) you get from the white LED bulbs. This light has a lovely warm glow and is easy on the eye. Rated 5 out of 5 by ohgrief from Brilliant lamps Bought these as replacements for 22 choir stall lights in church. Almost half the power consumption of the cfl's they replaced, twice the brightness, fantastic! Only reason for lower reliability is they haven't run yet for their typical 25000 hours so not easy to measure reliability!! Rated 5 out of 5 by Nicky1947 from Good light and long lasting These bulbs are just brilliant (pardon the pun). Long lasting and give a good light. Best used behind an opaque shade as the filament light can be a bit harsh where there is ether no shade, a clear shade or you can look directly at the bulb. Rated 5 out of 5 by LaMon1 from Very bright Great bulbs at a brilliant price. Gradually replacing all the bulbs in the house with these. They seem a lot brighter than any of the old energy saving ones giving instant light too.